Shoot Better Scores with a One-on-One Lesson from Top PGA Instructor Jack Lumpkin! Would you like to have a private, one-on-one lesson with the man voted Teacher of the Year by PGA? Now you can, just by popping in our "Tee to Green" DVD. 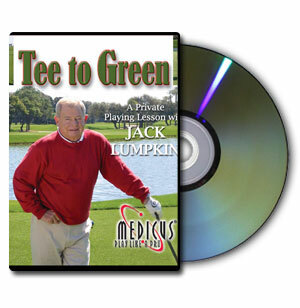 The Tee to Green DVD features 1995 PGA Teacher of the Year Jack Lumpkin, giving you a personal lesson to optimize your level of play! Let master teacher Jack Lumpkin improve every aspect of your golf game, from chipping to pitching, sand shots to perfect putts. You'll want to watch your "Tee to Green" DVD again and again, focusing each time on a different aspect of play. As the title implies, Jack Lumpkin's "Tee to Green" will help you improve your game from beginning to end. Fairway Woods, Pitching & Chipping! Reading Greens, Putting Speeds, Sand Shots, Downhill and Uphill Lies, and More! How to Dissect, Strategize and Play a Golf Hole From Three Different Perspectives! The Intricacies and Techniques of a Wide Variety of Trouble Shots! Improves your golf game from beginning to end!